Celebrities are not the body positive role models women need. I recognize that they have the easiest, fastest access to the mass public and that they may feel as though they are in the best position to point out the inherent flaws that exist within our fashion industry. They are, however, simply not the best people for the job, no matter what size or race they may be. When women have body image problems, they often do not stem from the fact that women were born with a natural aversion to their body shape. They do not begin at birth and grow from there: they are instilled in women as they grow, as they watch their bodies change. When girls are young, they are rarely criticized for being chubby or too skinny. Rather, they are praised as miracles of life and seen as some kind of proof of the relentless continuation of humankind. Girls don’t spend time in front of a mirror picking apart their flaws and comparing the size of their thighs with those of other girls. Instead, they spend their time learning, playing, and enjoying the mere fact that they are alive. They don’t learn the art of disliking their body until they are a bit older. When puberty strikes and bodies suddenly learn to shift their shapes to accommodate all sorts of new changes, that is often the first time a child will look at their body more closely than ever before and start picking it apart. Perhaps hesitant at first, they gain new techniques and master new insults for themselves with astonishing speed, until all they know is how to spot the flaws in a mirror before anyone else can begin to think about them. Not every woman goes through this process, and it’s most certainly true that not every woman encounters the same amount of distaste for themselves, or for the same reasons. 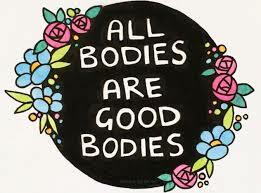 It is, however, a prevalent problem in today’s society, and the fact that celebrities are trying to step up to the plate to promote the idea that every body is beautiful seems a little ludicrous to me. First of all, most of the women who have been able to spearhead the movement seem to be occupying the very bodies that many young women who are just learning to hate their shapes aspire to have. Take Jameela Jamil, an actress and influencer, for example. She is a beautiful, strong, tall, and skinny woman who has spent countless hours spreading the body positivity movement. While she has spoken about her struggles with eating disorders during her teen years, her words about learning to love your shape seem to fall a little flat. She is a woman who seemingly has it all: the perfect body, a beautiful husband, and massive personal success. And yet, she wants to stand up for “normal” women who do not have the “ideal” body, with dating lives that are barely hanging together, and are struggling with day-to-day life. Perhaps her message is not falling on deaf ears, but it certainly is not helping the countless women who wake up in the morning and try to teach their bodies to change to her shape and size. I understand her argument that oftentimes, women of her shape get shamed out of speaking up, and I am by no means saying that is why she needs to step down from her position. Rather, I am saying that she represents an image, an ideal for countless women around the world, that they wish to strive for. When Jamil speaks, women could hear her words but filter them through her life position. By life position, I mean her celebrity status and her physical appearance. Once they filter her words through this, they could jump to the conclusion that the only way they can achieve the body confidence and positivity she advocates for is by achieving her same life — looks included. Jamil is not the only celebrity who does this. There are other celebrities who try to become leaders of this movement in hopes of helping other women find more self love, but who themselves seem to have it all. It is for this reason that I simply do not understand how we can post such successful, beautiful, and famous women at the forefront of such a massively important movement. These women that we look up to are wealthy and highly privileged. They have the time and money to afford personal trainers and crazy new health trends, which are simply not available to the mass public. Most women struggle with just trying to get through their work days without falling apart by the end, not to mention making fancy meals and going to work out for multiple hours a day. These massive wealth and class disparities cannot be ignored in this discussion, as they make up a large portion of the problem. We as women can no longer allow those who have the easiest access to such fundamentally important campaigns to take the reins and try to lead us. While they may understand the struggles that have to do with accepting and loving your body, they are not relatable enough, nor do they always feel attached to reality.They live in a world of glitz and glamor that the majority of us will never be able to understand. Instead, we must consciously choose to elevate those women who are among us and struggling to find inner peace, yet have chosen to not give up yet. They have chosen against all odds to make it their mission to love the home they were born into. It is those kinds of women who should be able to spearhead the movement meant to make us feel at home in our own skin, not those who are almost always impeccably perfect.